What do you like about First Reformed Church? We gather for a simple and informal one-hour service with inspirational music, humble prayers, and thoughtful, hope-filled reflections. 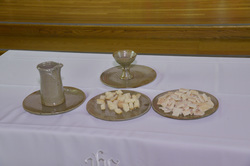 We celebrate open communion every first Sunday of the month. Are you looking for a simple service in a beautiful setting that will leave you refreshed and inspired? Consider visiting us on Sunday morning.